Publishing the results of your research is a fulfilling experience, both from a personal viewpoint, but also helping advance the orthopaedic knowledge. This chapter discusses the process from completing the study to formulating the final manuscript that is ready for submission, providing a structure to follow in preparation of the manuscript and tips on improving your writing style. 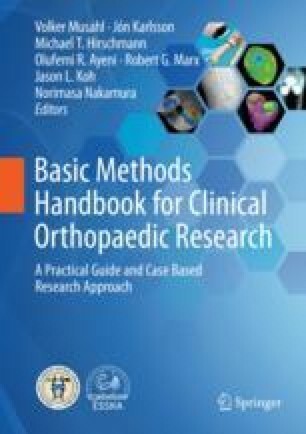 Research is essential in advancing the knowledge of the orthopaedic community, and publishing the results of research is an important part of the advancement of the knowledge. Writing and publishing research can be intimidating when you first begin. There are different forms of publication from case studies or series, controlled trials and systematic reviews or meta-analyses. Each requires a different approach to research, but the fundamentals of preparing the manuscript are similar. Following the prescribed technique gives the manuscript structure allowing improved writing and giving the reader the information they want. Once writing of the manuscript is complete, submission to a journal needs to be managed. Most articles will not be accepted immediately by the journal. Formal peer review will provide feedback that needs to be addressed in a timely manner prior to resubmission to the journal.